Monsanto already dominates America’s food chain with its genetically modified seeds. Now it has targeted milk production. Just as frightening as the corporation’s tactics-ruthless legal battles against small farmers-is its decades-long history of toxic contamination. 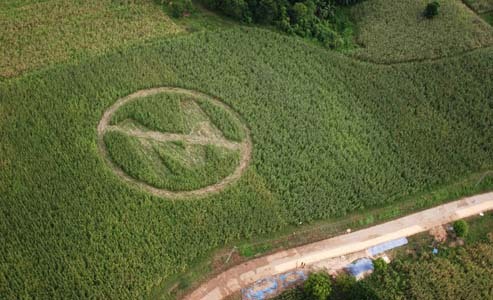 No thanks: An anti-Monsanto crop circle made by farmers and volunteers in the Philippines. By Melvyn Calderon/Greenpeace HO/A.P. Images. Gary Rinehart clearly remembers the summer day in 2002 when the stranger walked in and issued his threat. Rinehart was behind the counter of the Square Deal, his “old-time country store,” as he calls it, on the fading town square of Eagleville, Missouri, a tiny farm community 100 miles north of Kansas City. The Square Deal is a fixture in Eagleville, a place where farmers and townspeople can go for lightbulbs, greeting cards, hunting gear, ice cream, aspirin, and dozens of other small items without having to drive to a big-box store in Bethany, the county seat, 15 miles down Interstate 35. Everyone knows Rinehart, who was born and raised in the area and runs one of Eagleville’s few surviving businesses. The stranger came up to the counter and asked for him by name. “Well, that’s me,” said Rinehart. As Rinehart would recall, the man began verbally attacking him, saying he had proof that Rinehart had planted Monsanto’s genetically modified (G.M.) soybeans in violation of the company’s patent. Better come clean and settle with Monsanto, Rinehart says the man told him-or face the consequences.